MARVEL: The Avengers Vault showcases the iconic team from their beginning all the way through now in a visual collection like no other! The large book includes collector’s items such as an authentic Sentinels of Liberty fan club membership card from 1941 from the Captain America area of the book and Jack Kirby’s original art from Avengers #1, which shows Iron Man intercepting Loki’s decoy distress call. The Avengers Vault is an extremely detailed book, and should be included in every Marvel fans’ collection. The book features incredible illustrations and splash pages from a number of different artists. The Avengers Vault has ten removable special features which include posters, color guides, concept art, and much more! This extremely well-crafted book gives fans the opportunity to hold a piece of Avengers history in their hands. The Avengers Vault by Peter A. David focuses on the four most famous members of the Avengers – Captain America, Iron Man, Thor, and Hulk. The book goes into great detail about each character. 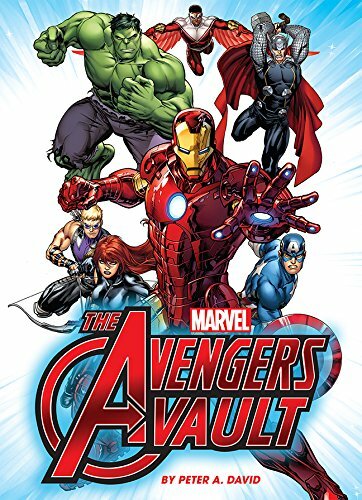 MARVEL: The Avengers Vault is a phenomenal book and is a must-have for fans of the Avengers!